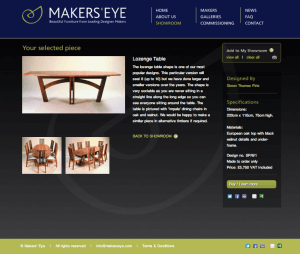 50 of Britain and Irelands top makers have joined a new website called ‘Makers Eye’, it is primarily aimed at linking millions of potential web based customers to very individual pieces of bespoke furniture. It is something that’s been tried before – I get a call every week from someone telling me they are setting up a website that will sell my work. Invariably they have no idea about selling bespoke furniture and usually no idea about selling full stop. Fact is just setting up the site to look slick and work well is the easy bit. 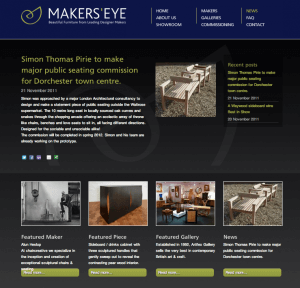 So what’s different about Makers Eye? Well it’s confidence in the people behind it: Tony Portus is poacher turned gamekeeper, a maker best known for his Cato rocking chair, already recognised as a classic piece of British design. Ross Fenn is one of the directors of Artifex Gallery in Sutton Coldfield, easily the best contemporary furniture gallery in the UK. Both of them understand furniture and the art of selling it. The other thing that makes this attempt stand out, is frankly it costs us as makers quite a lot of money. That’s because they are investing that in good PR, marketing and advertising, after all it’s the buyers who need to find this website. You can define your search in the showroom area according to furniture type / price / maker / geographical area. Clicking the image brings you to the makers own gallery area where you can see all their work on Makers Eye, if you want to find out even more there is a link to visit the makers own website. Price and location of the piece is displayed in case a potential client wants to see it in the flesh. There is also a news page plus plenty of other information about commissioning, buying and other frequently asked questions. It certainly looks lovely but will it work? Will it open up a new markets to British bespoke furniture makers? Well if it dosen’t it won’t be for lack of vision on the part of the Makers Eye team or commitment from the first 50 makers to take part.